This has been a great summer for us as a family. I live with my son in my own little apartment so I do get to see my grandchildren quite often. We all love to go outside to play in the huge backyard. The kids love to run – they are 2.5 and 7 (the baby is almost 1) so have tons of energy. A new game invented by us is called hit and run kid style. 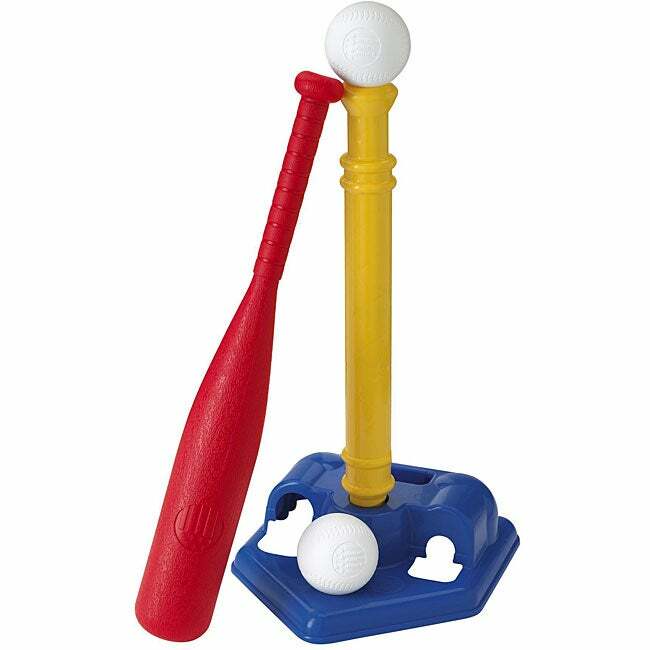 The materials needed in order to play this game are a plastic bat, a plastic ball, a tee to hit off of, and something to create bases – we just use 3 pieces of cardboard. We play with two adults – my son and I – against the two kids – Marshall and Olivia. They do most of the batting and we play the field. The object of the game is to get them out before they score a run….Nobody really keeps score and Jason and I do get to bat occasionally! When we first started playing this game Marshall, the two year old, was hitting the tee more than the ball. Now he is hitting the ball and hard! He really loves the running part and laughs while running the bases. It has become one of his favorite activities! He will practice on his own and really is getting quite good for his age! Olivia, the 7 year old, can really smack the ball and will sometimes hit one of us, sometimes hit the ball over our head, and still hit the tee once in awhile…She loves the game too as we are doing it together! This is just one of the activities we are enjoying this summer. i hope you and your family are having some fun and enjoying each others company just like we are! The kids grow up so fast so enjoy them while you can! This entry was posted in Uncategorized and tagged family time, great summer fun, kids fun, kids spending time together, outdoor fun on July 26, 2017 by Keith Maki. One look at the calendar tells us that the school year is almost over for the year. Even if we don’t have kids in school summer is going to be upon us in no time! All of us want to find some summer fun for kids and parents so we can spend some quality time with each other. I always enjoy taking some time of to spend with the kids doing things we all enjoy and trying new things! A budget is in place but I know fun times are in order! One of our favorite places to go during the break is to the Minnesota Zoo. An entire day can be spent enjoying the animals, walking the paths, and loving the time together. It is a great way to spend a day with all ages of kids and adults alike! If you can budget it go to other state zoos – it is a great experience and a nice little vacation! A great place for kids and adults! A family place in Minnesota where we hit at least 4 – 5 times per summer is Valley Fair. It is an amusement park with rides for little ones and adults. It has water rides, roller coasters, entertainers, etc. so there is always something to do! I am sure you will have one close to your house! Several years ago we invested in a large kiddie pool, built a sandbox, and added a swing set. We do have picnics right in our backyard! It is a fun way to spend time together or just the kids can play with their friends if they want to… We also go to local parks so they can run and burn off some energy! We are blessed in our state of Minnesota to have many beaches and swimming places to go to. Our family will just go swimming for an afternoon or evening…The kids love the water as do I so it is another way to spend time together… Sometimes the kids invite their friends and families to join us and then we all make a day out of it! Bike riding is another activity we do together. It is good exercise and can be a lifelong passion! The kids love it and we can just ride around home or go to a bike trail. kids having fun make us all smile! I know most of you have to work and can only take a few days off…that is normal.. It is not always how many extra days you have with the kids it is what you do when you have them! When you are with the kids make the most of it… Take a week or two off this summer and spend it having fun with the kids! Weekends are made for outdoor activities whenever possible! Your kids love you and want to spend time with you — please grant them their wish! This entry was posted in Uncategorized on May 9, 2017 by Keith Maki. When your child is born you are not sure what interests they will have and are not even thinking about it at the time. The blessing you have before you is all you see through the happy tears in your eyes. After all the sleepless nights are over and they have grown into young people they will express interests in doing different things. Please let them try and, when the time comes, participate in the activities your child is involved in. It will make a huge difference not only in their life but in yours as well. There are several ways you can accomplish this. The easiest way is just to be there. Your child is going to look for you at whatever event they are involved in. They want and need your support…Please don’t let them down. A second way is to become the team parent. This will involve taking more time and organizing things like carpools and snacks. It can be a rewarding experience and you will get to know all of the parents and children in the activity. It is fun but only if you make it so! A third way is to help out at the games or event by officiating, selling candy, or whatever else is needed. At most events parents are needed to assist in things and when you help it helps both your child and the rest of the team. The last thing is to coach or be an assistant to the activity. This would mean giving more time but most of the teams will need help until your child is in high school. You don’t have to be an expert to help run drills and be an assistant coach. If you are an expert you could be the head coach and share your knowledge. Your children should be the most important children in your life. Watching them play a sport, sing a song, play an instrument, debate, or whatever they choose to do is a privilege you must not miss. They want you and need you in their lives…Please be an active parent who really cares and don’t disappoint them! This entry was posted in Uncategorized and tagged active parent, love your children, parent, participate in kids life, single parent on April 7, 2017 by Keith Maki. My purpose in life is to love my children with all of my heart and soul. I put them first in all matters as they are the number one priority in my life. Being a parent comes first and everything else comes in a distant second or lower. If you are asked a question about what your purpose in life is and you are a parent how would you answer the question? It was very easy for me to answer. My purpose in life is to love and nurture my children and to help them be great adults. I made many sacrifices over the years to make sure I had the time to spend with my children. This is what I wanted to do and they needed from me. My employers had to be flexible. I wanted to help coach baseball and football for my son plus attend his basketball and wrestling. My desire was to see my daughters games whether soccer, basketball, or volleyball. i did not want to miss a conference or a concert for either child. When they were ill I wanted to be able to stay home with them. I did have trouble with two different employers who did not believe a dad should stay home with and take care of his kids. I ended up leaving those jobs which was a good thing. It was truly a discrimination issue as the moms did not have the same problem. My kids came first! Their mom watched them sometimes and spent a lot of time with them but I was the primary custodian and it was my responsibility and i loved every minute of it! I passed up promotions and other jobs because they would not be flexible. I made enough money so we could make it! The title I wanted most in my life was DAD! It still makes me feel great even though my kids are grown up when they need my help for something! You don’t have to give up everything in your life for your kids but they need to be your highest priority! If you can’t find some sort of balance between your work life, personal life and your home life it will show in your relationship with your children. This will last from childhood all the way for the rest of your life. Your kids don’t need all the material things they get in life – the main thing they need in their lives at all time is YOU! This entry was posted in Uncategorized and tagged kids come first, love children, parental love, parental responsibility, purpose in life on February 28, 2017 by Keith Maki. In my life I have literally gone from cub scout to parent. I started in cub scouts when I was 6 years old. It was a fun time in my life and I learned a lot. I kept in scouting until I was 18 years old. The discipline I learned along with the outdoor skills and leadership skills will never be forgotten! I loved scouting. It could be because my dad was loved it and encouraged the participation. The leaders we had loved to camp out so we had lots of them. My chance to be a leader came early which suited me just fine. I am still very proud of all my accomplishments in scouting especially my Eagle Badge! How does this all tie in with being a parent? A parent must have some leadership skills. Scouting teaches you how to make good decisions and how to follow through on the decisions you make. What about changing diapers and taking care of children? A scout is taught to follow through with what needs to be done and learns to do it right. They place themselves in the background and take care of the task at hand. How about doing chores around the home? Both parents and scouts have to live up to a certain code of conduct. They must get things done so everyone is safe. Whether it comes to doing laundry or just taking out the trash both sides have to do this. When do you ask for help? Whenever you need it. A scout and a parent are not to proud to ask for assistance as they have to get things done without jeopardizing the health and safety of anyone involved including themselves! Do they use manners and expect others to? Yes! Both parents and scouts want everyone to say please and thank you. They want proper manners to be used at all times not just when convenient. A scout is much better at this than most parents! We are mostly do as I say not as I do.. In conclusion if we go by the scouts law – A scout is trustworthy, loyal, helpful, friendly, courteous, kind, obedient,thrifty, brave, clean and reverent – we as parents would really be teaching our kids great words to live by! This entry was posted in Uncategorized and tagged cub scouts to parent, good rules to follow, learn from scouts, love your kids on February 6, 2017 by Keith Maki. It was the summer of 1992. I am mowing the lawn and my five year old son Jason asked me if he could go to the park with his best friend Paul. I said sure but asked him Where can Laura be? He told me she was in the house playing with her toys. The boys walked through the yards all the way to the park and I began mowing again. The edge of the park could be seen from the back yard of my house. You did not have to cross any streets or face any traffic to go to the park from the house. I was completely confident the boys would have a great time there and be totally safe. It took me about 30 minutes to finish the back yard then I went to the front. The front took me another 20 minutes or so. If I add in the time I visited with the neighbor and put away the mower it might have added up to an hour. It was now time to go in and clean up. I entered the house and called out “Hi Laura”. No answer. In my mind I thought she was just playing a game of hide and seek with me so I just went along with it. I washed up and started looking. She was not in the basement where I cleaned up. Up stairs I went. She was not hiding in the shower..or in the closet…or in her bedroom…or in my bedroom…or in my closet..Where can Laura be? I was now starting to worry ! Laura was and is a very independent person. Her favorite saying is ” I do what I want”. The search was now on for a missing almost three year old! 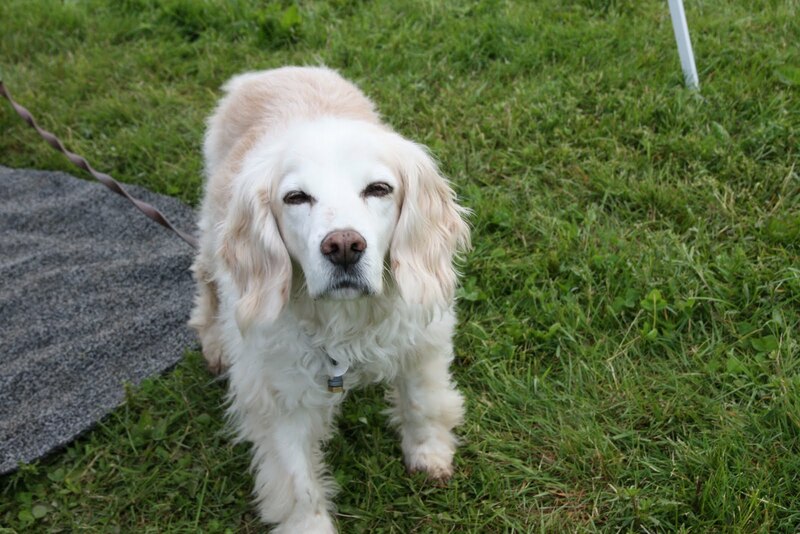 I took Sammy my mixed breed cocker spaniel and child finder to assist with this major task. We checked in the neighbors yard as her friend lived there.. No Laura. We continued down the backyards towards the park checking every yard she could have been in. Panic is setting in a bit at a time…I am calling her name with no response.. Where can Laura be? She is not allowed to walk to the park by herself so she would not do that… She listens to her directions..I listen now and Sammy starts running towards the park. We have found Laura! She is at the park with her brother and Paul! She is not supposed to be there but she does what she wants! I was so happy to find here and she was so happy to be with the boys that all I did was ask here to tell me next time and stayed to play with the four of them! I guess she taught me! This entry was posted in Stories and tagged daughter missing, independent daughter, playing outside, scared parent story, sneaks away, where can she be on January 17, 2017 by Keith Maki. All parents worry about having and raising healthy children. When you have children with painful diseases whether they are hidden or not it is a hard thing to live with. You child is yours from birth until death – hopefully yours comes before theirs as it is not right for any parent to have to bury their own child! My mother constantly worries about me. Why? I am almost 60 years old but I am still her baby. I have rheumatoid arthritis which slows me down from my writing and other things. It did change my life in many ways but I am handling it pretty well..But my mother checks up on me because she is my mom and I know she sees me as her child running around and playing with my friends..How do I know that? I have two children of my own and that is how I see them at times! This really is not about me so I will move on. This entry was posted in Uncategorized and tagged bullied children, children with depression, painful disease in children, parents love their children on January 17, 2017 by Keith Maki. You can probably tell by the theme of my website i am really an advocate for children. I love my children and grand children with all of my heart and sole. I also want all children to have the same love from their parents and grand parents and the chance to live a long and happy life. My children and grand children know how it feels to be cared for at the top level. I honestly believe all children deserve to be healthy and loved. They must have the same feeling of security and being cherished as the children in my family have. I am sure you know I make a few cents for each purchase you make via the links I have placed on my website. It is a way for me to pay my medical bills which are very high due to my rheumatoid arthritis. The money allows me to keep this website going which is a passion of mine and I hope it touches your heart in some way too. I am doing something for the next year to help children with physical and emotional issues get the help they deserve and need. My website is going to donate 10% of all sales made in 2017 to ST. JUDES CHILDRENS RESEARCH HOSPITAL The reason I chose this place is it works on both research and hospitalization with no cost to the families. They work on both physical and mental issues. The main reason is they specialize in the care of our most precious ones…our children! The website address for St. Judes is https://www.stjude.org/ If you go and take a look at all of the things they offer you will be surprised! They are a great place for a child with severe diseases like cancer to go for treatment. It is a place where the kids are with other kids like themselves so they don’t feel out of place. I really believe in the mission and work they do at St. Judes which is why I am doing this. St. Judes leads the way the world understands, treats and defeats childhood cancer and other life-threatening diseases. You may remember them from ads by Marlo Thomas or their founder Danny Thomas. I hope you will purchase Amazon or other products through my site. When you purchase anything from me it will not cost you any more and you will be helping children. If you choose not to please donate to St. Jude on your own!! This entry was posted in Uncategorized and tagged single parents. single parents help. children medical. on January 9, 2017 by Keith Maki. My name is Keith Maki and I am the single parent of two great children, When my single parent adventure started Jason was 7 and Laura was 5. I have no clue how to take care of them on my own outside of the basics of feeding them, getting them to bed, and doing their laundry. There is a lot to learn! I did find some much needed help. My parents helped me with over the phone pointers when needed. The kids mother and I got along so it made life easier on both me and the kids. I read some books in order to get myself organized. The kids and I learned how to be flexible and how to talk with each other which resolved a lot of issues. We had our trials and tribulations but it was a memorable experience. My single parent adventure is one I will cherish forever and would never trade. We learned so much from each other and grew closer by doing so. If you are one of the adults who believe you can’t learn from a child you are badly mistaken! The one thing that is an absolute must in any single parent adventure is sacrifice. Your priority has to be the children. They have to be first in each and ever decision. They will be busy and demand all of your time and energy. If you are not able to place them as your main focus you should rethink your situation. Children need to feel they are the most important people in your life. You are the adult and they depend on you and your unconditional and not distracted love. This site is dedicated to the adventure we had together – the two kids and me. It was a wonderful journey filled with twists and turns but mainly laughs and some tears but it all lead to us growing up together. This entry was posted in Uncategorized and tagged children are most important, learn from your children, parenting is an adventure on November 23, 2016 by Keith Maki.